When dancehall singjay Stitchie became a candidate for baptism, he read a new meaning into his stage name instead of dropping it. The unlikely candidate reasoned that while the comic stagecraft of his days in the world had left people in stitches, the post-conversion Stitchie would stitch people’s lives back to God. Instead vacating the dancehall, a novel tendency of reggae he had helped to establish in the 1980s, Stitchie simply weighed spiritual energy into his workflow, becoming the first major exponent of gospel reggae. It might have been the maintainance of these trademarks across Jordan which forced some to conclude that Stitchie was on a publicity tangent which would soon fizzle out. After all, similar commitments by his showbiz peers, notably Ninja Man, had been shortlived. Sceptical onlookers gave Stitchie two weeks to relapse to his former ways but the new gospel proponent kept them waiting longer than they had expected. It is now eight years and they are still waiting. 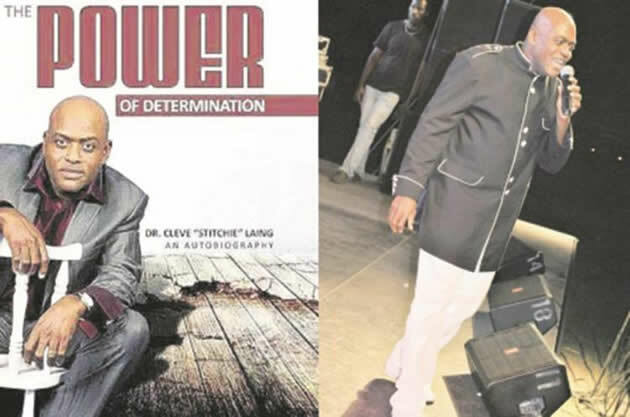 Stitchie attributes both artistic prowess and spiritual longevity to resilience in the heart of the odds, hence the title of his new book, “The Power of Determination”. The autobiography not only provides insight into one of the most exceptional dancehall careers of all time but real life wisdom from a man who has emerged with testimonies from the various combat zones of life. A legend in the game, Stitchie was among top earners, having been the first dancehall artiste to be signed to a major label, dropped 14 number one singles in one year, consistently outclassed his peers at clashes and toured almost every continent. He left all that and laid his artistic talents on God’s altar after surviving a near-fatal car accident on his way to a show. The urge for a transcendant experience had started building up after the tragic death of his mother whose memory he addresses with inestimable regard in the book. The days of “Two is Better than Too Many”, “Wear Yu Size”, “Natty Dread” and “Body Body” were definitively past. In came “Fast and Pray”, “Serious Message”, “Warpath” and more recently, “Temptation” and “Letter to Dad”. The currency for such a transition could only be determination. The artist was shunned by his former peers and bypassed for lucrative tours by promoters because he insisted on singing his post-secular discography only. During that austere patch, he lost all the properties and luxury gadgets he had acquired during his peak years and was officially sleeping on the floor, travelling on tyres of different sizes, being fleeced of his royalties and enduring cold scorn from those who had hitherto saluted him as the dancehall lieutenant. “The Power of Determination” is also an unsparing account of the degenerate living conditions in Jamaica and the Babylon system which squeezes ghetto youths to fatten politicians, and divides brother against brother to oil the levers of capital with the blood of the vulnerable. Stitchie gives an emotive rendering of the costly toll political violence has taken on the Jamaican ghetto, and how it robbed him of esteemed friends. The struggles of being a child of divorce, a burden saddled by several of the keynote Jamaican artistes, are also captured in the memoir. Stitchie’s parents separated when he was an infant and he grew up in the custody of his mother. The memoir reveals different episodes working together to steer Stitchie towards his evangelical mandate, beginning with his mother’s positive influence on him. Although he was not yet consciously dedicated to Christ during his peak years in secular dancehall, Stitchie believes that the earnest intercession of his mother sustained him. He resisted conscription into a criminal clique which later went on a murderous rampage in his neighbourhood before retribution routed almost all the members. He also stayed away from ewes which attack wolves, a decision which spared him the sexually transmitted infections which have been all the rage ever since. Stitchie imports his storytelling mastery from several of his No. 1 hits to the autobiography. The same goes for the humour which has remained a recurrent plug-in of his music, even after his near-death theophany. In one instance, he pokes fun at a fellow artiste who went too far in his determination to exploit every last bit of hospitality at a hotel room his entourage shared, only to spray Baygon into his armpits. The poor brother had to show up for the show holding up his arms in an apparent sign of surrender as the insectside scorched his armpits. Another hilarious episode is when Stitchie was confused after failing to find his Starlet after a performance such that he looked for it underneath other cars. Even his conversion experience had an element of humour. A hesitant Stitchie asked why baptism was mandatory whereas the thief at the cross was promised a place in Paradise when he was apparently not baptised. “How do you know if it did not rain that night and that was his baptism,” a tough female evangelist retorted, disarming Stichie of his last line of resistance. The conversion was facilitated by a Canadian boy who came to Jamaica with Gideon Bibles for 30 celebrities. While nursing injuries from the near-fatal crash, Stitchie dug into the Bible given to him at the Reggae Sumfest and life loomed into perspective. The Bible became the all-sufficient solution to the questions which had troubled him but also had an unsettling effect on him. He was no longer at peace with his secular career! Stitchie hibernated from the spotlight to study the Bible and released his first gospel reggae album “Real Power” in 1999, two years after his spiritual crisis. A determined series of release followed thereafter, soon followed by the accolades of altar. His narrative of losing it all and finding the way almost sounds like a popular culture miniature of Job. Stitchie was awarded an honorary doctorate by the Cornerstone Christian University in Orlando, Florida , in recognition of his contribution to gospel reggae music. Along with Papa San and Sanchez from Jamaica, and a host of other musicians worldwide, Stitchie represents showbiz converts who gave up everything and adopted the Christian faith even as their careers were blazing hot. His No. 1 track from 2004, “Fast and Pray”, is a bold, name-dropping admonition to fellow dancehallers, including Bounty Killer, Yellow Man, Beenie Man, Capleton, Ninja Man, Tony Rebel and Sizzla to give their lives to Jesus. Stitchie narrowly missed representing Jamaica at the Olympics when he sustained an injury during training. He decided to go full time into the dancehall where there were no chances of getting a “voice pull”. The memoir portrays him as an unusually multi-talented man who has worked as a physical education and biology teacher, dabbled in art, performed as a singjay and served as an ordained pastor. Notable spiritual crossovers in literature include the great writers Fyodor Dostoyevsky, Evelyn Waugh, T.S. Eliot, Leo Tolstoy and C.S. Lewis. Stitchie has expressed his commitment to continue championing his faith in the medium of the written word. “The Power of Determination” is a convincing foretaste towards this new direction.